So, I was trying to decide what to give my brother's girlfriend for her 21st birthday. She likes to bake as well, so I started thinking up ideas of what I could make for her. Then I figured I would be clever and make her something specially for her 21st... so began my thought process on specifics. My husband and I were in Florida for my birthday weekend, and even though I'm not much of a drinker myself, we decided to get a bottle of wine. 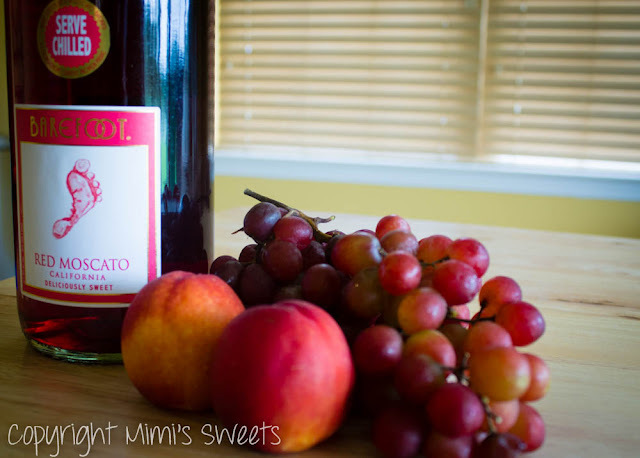 I do not drink red wine, but I do like Moscato... so when we saw this Red Moscato by Barefoot we decided to take a chance and try it. The night we tried it out, I also happened to be eating a bowl of vanilla ice cream for dessert while we were catching up on one of our favorite tv shows on Netflix. I still had the flavor from the ice cream in my mouth when I took a sip of the wine... and wow, did it taste good together! The back of the bottle does say that it's made with bing cherries and peaches, so I guess it shouldn't come as too much of a surprise. 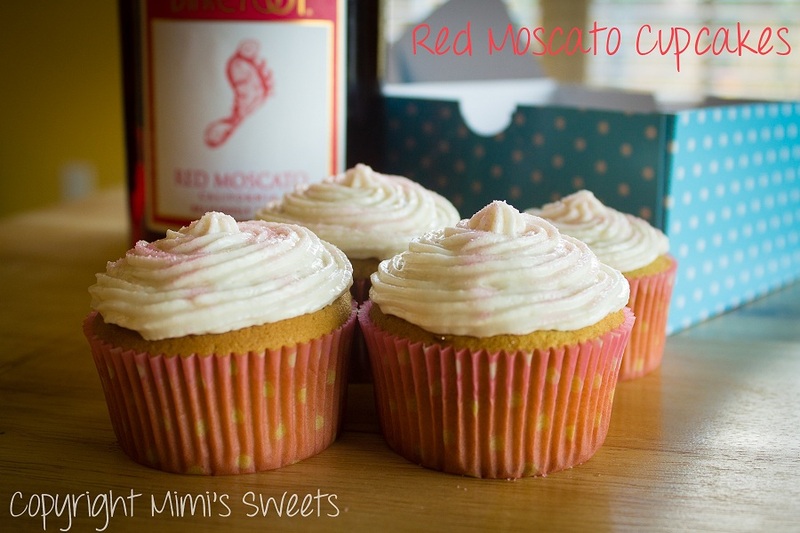 Anyway, that's how I came up with the idea of making Red Moscato Cupcakes for my brother's girlfriend for her birthday. 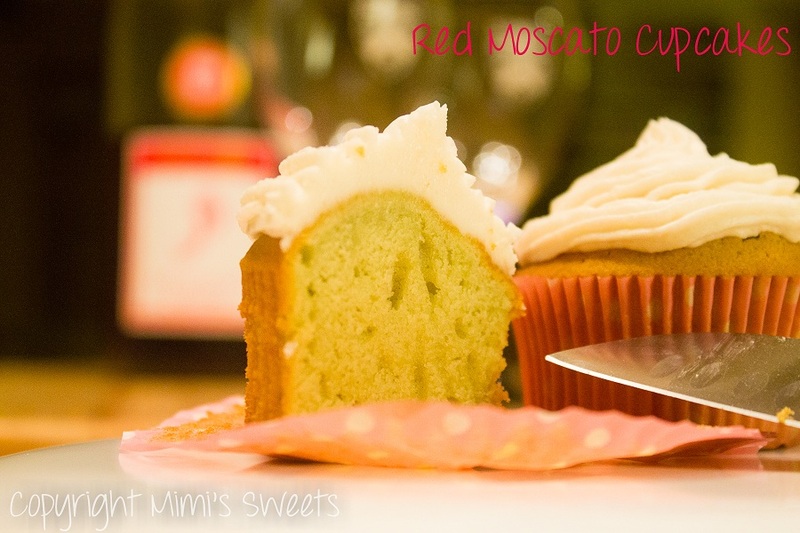 I learned from my experience in making my Margarita Cupcakes to back off on the alcohol in the cupcakes just a bit. I also wanted them to still taste like vanilla cupcakes, but when you paired them with ice cream, cherries, peaches, or moscato, it would bring the flavor out. I used moscato in the cream cheese icing and the cupcakes, and funny enough, when you cut into the cupcakes they had a very slight green tint to them from the red wine. They turned out perfectly, topped with pink sugar sprinkles and all! So, grab a cupcake and some fruit, a bowl of vanilla ice cream, or a glass of wine (or all the above!) and savor the sweet flavors from this lovely cupcake!